where to start the outlines or fills? how many strands of floss? Let me help you untangle the craft of blackwork. Getting those outlines in place first, is the best place to start. Although, if you are a keen cross stitcher this will seem backwards. The outlines give you an edge to work up to, when you fill the area with patterns. You don't need to count the number of repeats and work out where each one finishes. You just stitch until an outline stops you. Easy! Not all blackwork designs use outlines. The fill pattern suggests the outline, as shown in the pictures below. In the first photograph you eye expects there to be an outline around the boat. It sees the patterns as blocks of tone and you don't notice that it is missing. The patterns are small enough to not tell our eyes any different. When you fill an area with a larger, open pattern, the missing outline is more obvious. Your eye has more trouble imagining it and the picture makes less sense. The shape of the larger sail doesn't look "right" here. Let's swap things around. We are borrowing a technique called assisi, here. We have stitched the background and left the picture area empty. 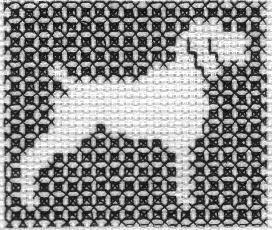 Again, because the fill pattern is small, your eye sees the dog as if has an outline. How many strands of floss should I use? Most of my patterns call for two strands of embroidery floss for the outlines. You could substitute this for one strand of a thicker thread, instead. Cotton a broder or Pearl cotton number 8 would work well. The basic idea is that the outlines show up to separate the areas of a design. 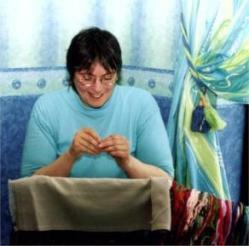 The fill patterns are then worked with a single strand, or thinner thread. Personal preference plays a part here. 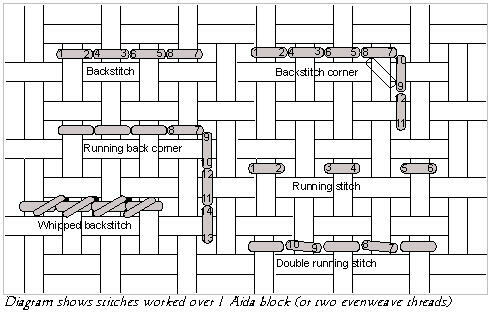 Double running stitch is the traditional stitch used for blackwork designs. For many patterns this means the work is as neat on the back as it is on the front. Done this way some patterns are, in fact, identical on both sides. Another name for this stitch is Holbein. Named after an artist who painted portraits of people wearing clothes decorated with blackwork. 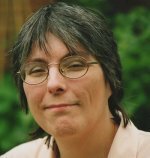 An alternative stitch to use is back stitch. You may find this easier to begin with. You don't have to work out a "route" to take around a pattern. This method is not reversible, but you may prefer it. It creates a thicker line on the reverse side than double running stitch. If worked on a fine fabric, you may also see the thread from the front when you turn a corner. Running back stitch enables you to prevent this by cheating a little. The following diagram shows all three options. Please note that none of these will give a reversible finish. They can be further decorated by "whipping" them. How do you do this? Slip a threaded needle through each stitch without piercing the fabric. This helps to cover the gaps between the stitches, giving a more solid line. If you use a metallic thread for the whipping, it gives an attractive effect. If you haven't tried double running stitch before you might like to have a go. 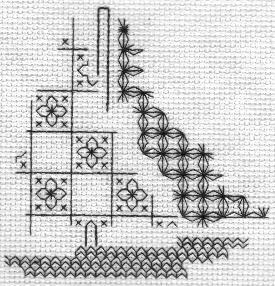 My first free blackwork pattern shows you how to do it. If you prefer you can move on to practicing some filling stitches. 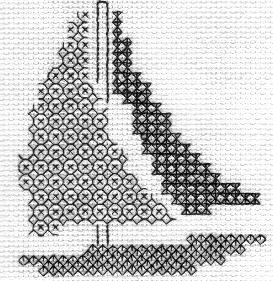 or download my Blackwork for Beginners ebook.